Why do I use Smart Switch after buying a new Samsung smartphone? Home Downloadables Apps Why do I use Smart Switch after buying a new Samsung smartphone? If you buy a new Samsung smartphone, you should take advantage of Smart Switch, which is used to transfer data from the old smartphone to a new one. See why it is worthwhile to transfer content through Smart Switch. Smart Switch is an application that is pre-installed on the new Samsung smartphones, respectively. You can download it right away when you start your smartphone. As part of your phone’s initial setup, you are prompted to copy data either from Samsung Cloud or your old device using Smart Switch. You can transfer data using Smart Switch either wirelessly or via a USB cable. Faster cable transfer is recommended, which we recommend. You can also transfer data from any Android devices running 4.3 or higher, as well as from iOS 5 and above devices, respectively and also from devices running the BlackBerry 7 operating system. If you decide to transfer data using a cable, you can use a special USB connector, which is often included in the package of new Samsung smartphones. In the case of this article, a Samsung Galaxy S8 was used to transfer into the Samsung Galaxy Note8. The source device is the Galaxy S8 to which a USB-C cable end was plugged. At Galaxy Note8, the second part of the USB cable was plugged using a special USB connector. The Smart Switch app checks if the source device is installed in the same Smart Switch app. If not, you can easily install it when prompted. Subsequently, the connected smartphones are merged, and the new one searches the old ones to find out what you can transfer. We had up to 17.60 GB of data in the Samsung Galaxy S8, with an estimated 47 minutes of data transfer. 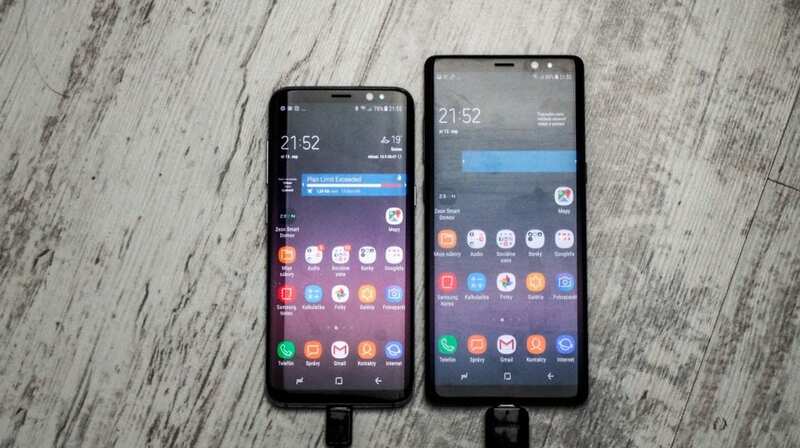 The huge advantage is that if you transfer data between Samsung devices of the last generation, you will create an old image in the new, including tapestries, app placement on the home screen, including folders, and so on. Such a detailed data transfer between the devices would be hard to find. During the transfer, we were surprised that all data was copied to the new Samsung Galaxy Note8 in about 10 minutes. The remaining time estimated by Smart Switch for data transfer has spread to the actual installation of data in Samsung Galaxy Note 8. Most of the time, the installation of all applications from the old device took place. Yes, all your apps will be transferred and installed with the Smart Switch. Of course, if you want to log into apps (such as bank apps, social networks…), you’ll need to re-enter their usernames and passwords in the new device. It’s just for your protection. You’ll be surprised to learn that details such as Wi-Fi with their passwords, bookmarks in an internet browser, alarm settings, documents, or voice memos will also be transferred. If you confirm this, in the beginning, pictures, music, videos or messages will also be transferred. If you have forgotten an item, you can also run the Smart Switch again and, for example, transfer the contacts only to the next connection. If you try Smart Smart once, you will believe that buying a new smartphone will no longer be an obstacle. Rather, conversely, in a few minutes, you can have everything from your old smartphone in the new, just the way you set it up, set it up and how you like it. Even in our case, we can use the new Samsung Galaxy Note8 just a few minutes after it’s bought.